The Health Minister will be questioned on the HSE service plan, which details how the executive will cut €619 million next year. POLITICIANS WILL TODAY have a chance to question the Minister for Health on the HSE service plan for 2014. The document, which contains plans for cuts of €619 million in 2014, was released in December. The headlines then went to the scaling down of plans to cut around €113 million from the medical card budget. Instead, savings of €23 million will be sought. The issue of overspending will be raised with Reilly, an issue that came up again over the weekend. Reports on Sunday indicated that a secret cabinet memo suggested that the government would sanction additional funding to keep the health service safe for patients. That led to angry calls from the Irish Medical Organisation for assurances from Reilly that General Practice would be better funded. “We want better enhanced resources for General Practice so we can do more for our patients,” he said. The meeting will begin at 5.15pm today. Email “James Reilly to face Health Committee today”. 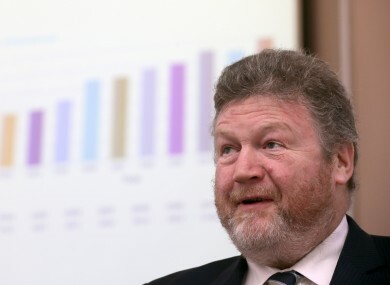 Feedback on “James Reilly to face Health Committee today”.